Adds a Blueprint Deployer chest which can be connected to the circuit network to build a self-expanding factory. Deploy blueprint. Construction robot signal can be any value ≥ 1. Deploy blueprint from book. 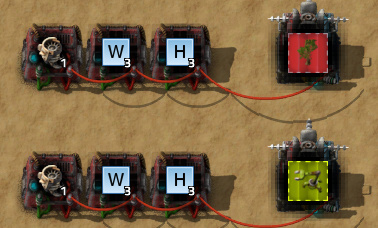 Construction robot signal selects which blueprint to use. If it is greater than the size of the book, the active blueprint is used instead. Deconstruct or upgrade area. W = width, H = height. Supports filters. The deployer chest will never deconstruct itself with this command. Cancel deconstruction or upgrades in area. Alternative deconstruction commands that do not require a deconstruction planner in the deployer chest. -2 = Deconstruct the deployer chest. -3 = Cancel deconstruction in area (only in version 0.17). +1 = Cancel deconstruction in area (only in versions ≤ 0.16). Copy blueprint or blueprint book. 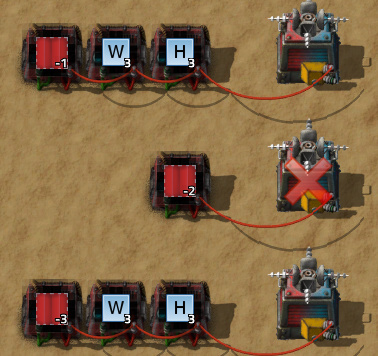 The original blueprint must be in a chest (or inserter with read hand contents) on the same circuit network as the deployer chest. Delete blueprint or blueprint book. X and Y signals shift the position of the construction/deconstruction order. R signal rotates the blueprint. R = 1 = 90° clockwise, R = 2 = 180°, R = 3 = 90° counterclockwise. Blueprints are centered on: 1) The first wooden chest in the blueprint, 2) The first deployer chest in the blueprint, 3) The center of the blueprint.